So what’s in The Eagles Almanac 2018? There’s nothing like premiership success to get writers to pop their heads up. And so, during the finals, and in the weeks after the (brilliant) 2018 Grand Final we received some fantastic pieces which really captured the moment. The Eagles’ season is captured in this collection of 55 pieces – match reports, memoir, reflection, player profiles – by 40 writers. Here’s some of the pieces in The Eagles Almanac 2018. And the contents page appears at the bottom of this post. 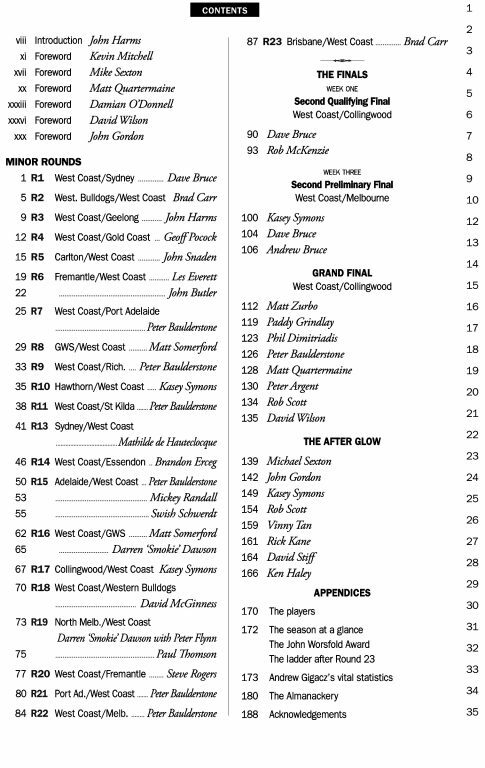 The Eagles Almanac 2018 also includes the usual match reports for each of the home and away rounds. 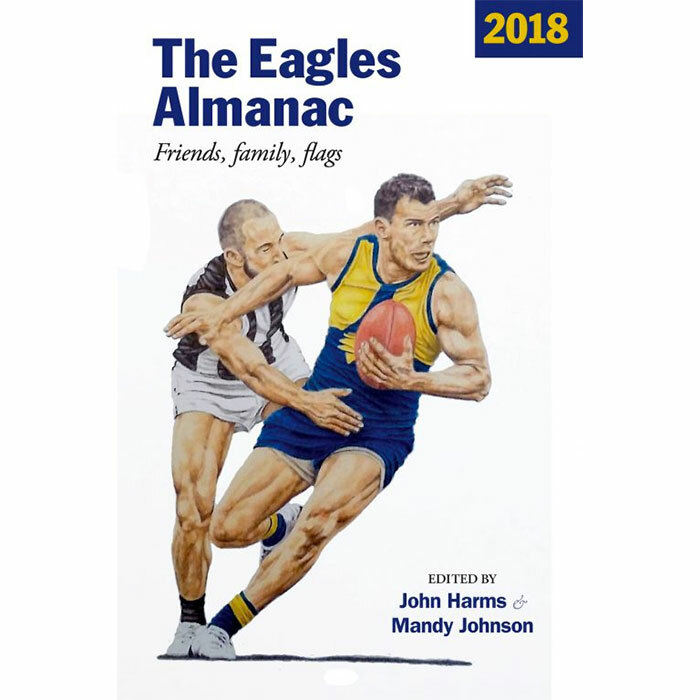 The Eagles Almanac 2018, an account of the Eagles’ 2018 premiership season, is written in a warm and conversational style by fans from all walks of life, it includes observation, reflection, memoir and (maverick) match reports. Review copies and extracts are available. Noting that there’s a piece by Kevin Mitchell makes me especially eager to get my copy. Always interested to read the sporting thoughts of musicians like Paul Kelly who once wrote of the coexistence of grace and danger in football. Whenever we hear Vance Joy on the car radio I mention to our boys how he and I featured in the same edition of the Footy Almanac. Sadly likely to be our only shared stage! Love me a bit of Kevin “Bloody” Mitchell – reminds me of the first Almanac I ever purchased, 2009’s edition, which featured words from North tragic Tim Rogers. Can’t wait to get stuck in! Sorry Jarrod – Bloody Kevin is the old redundant WA – racist and homophobic. The sort of crass idiocy that would never grace the generous, civilising pages of the Almanac. Our Kevin Mitchell is the lead singer of Jebediah and has a ‘pop’ alter ego Bob Evans. Sorry, PB, it was a rather obtuse tongue-in-cheek reference to the days when the Jedediah frontman started to sing as solo Bob Evans – the nickname of Kevin “Bloody” Mitchell got a bit of a run on the radio and at gigs that I went to. Quite right about the other Kevin, the less said about him the better. I believe the Kevin ‘Bloody’ Mitchell in question calls his residence ‘Disgraceland’.